Netflix's 'Black Mirror' Is Doing a 'Star-Trek'-Themed Episode! The science-fiction show "Black Mirror" ventures where no one has gone before in the "Star Trek"-themed Season 4 episode called "USS Callister," coming in 2018. A smarmy captain oversees a space crew filled with people wearing bizarre hairstyles and clothing. Yup, it's got to have something to do with "Star Trek." 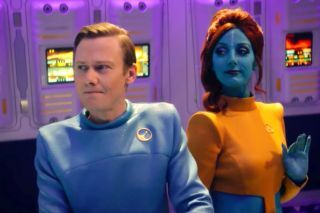 Netflix's "Black Mirror" series, which is sort of like a modern "Twilight Zone" that looks at strange tech in the near future, just released the YouTube trailer for a new Season 4 episode called "USS Callister." No release date was published, but we assume it will warp to your television screen sometime in 2018. The episode boasts several well-known television stars, including Cristin Milioti ("How I Met Your Mother"), Michaela Coel ("Chewing Gum") and Jimmi Simpson ("Westworld"). Stay tuned for more details on when Season 4 and "USS Callister" will be released. This isn't the only recent "Star Trek" TV parody. "The Orville," a Seth MacFarlane space spoof that clearly borrows from Trekkie lore, premiered this fall. The show follows the adventures of a crew, including an ex-husband and ex-wife who must work together in the confined quarters of the captain's bridge. It was recently renewed for Season 2. Traditional "Star Trek" episodes are also continuing on television. This fall, "Star Trek: Discovery" premiered on CBS All Access. It follows the adventures of renegade crewmember Michael Burnham (Sonequa Martin-Green, of "The Walking Dead"). The series wrapped up its midseason finale in November and is also preparing for a second season.